A perfectly portable breakfast or snack! JUST when you were beginning to think…I wonder what happened to that juicy blogger girl? Here I am! Ok, so maybe I am flattering myself and no one was really thinking that because you all forgot I existed. I like the first scenario :). I have a long list of yummy things that I need to get on Juicy Bites…and I am starting with these little guys. 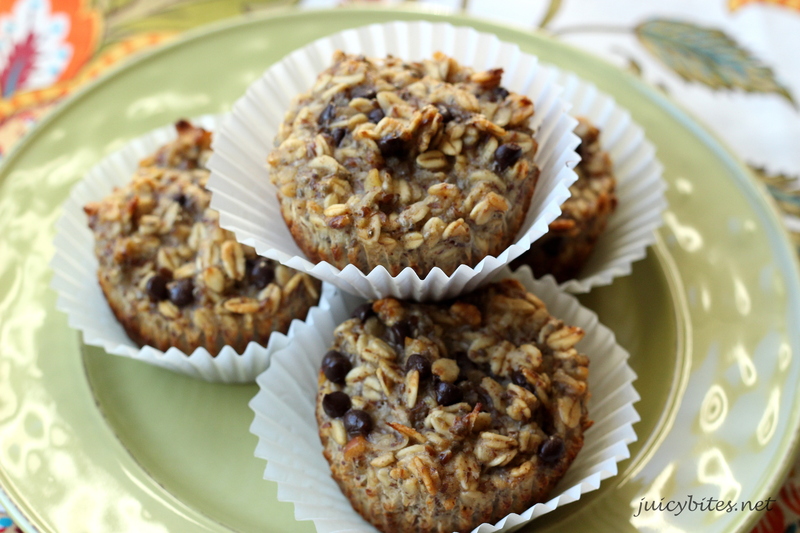 My Baked Oatmeal Breakfast Cups. I have seen a lot of different recipe ideas on the web with baked oatmeal. I love the idea for a few reasons – they can be made gluten free, you can throw just about anything in them, they are totally simple to make, AND they are tasty! 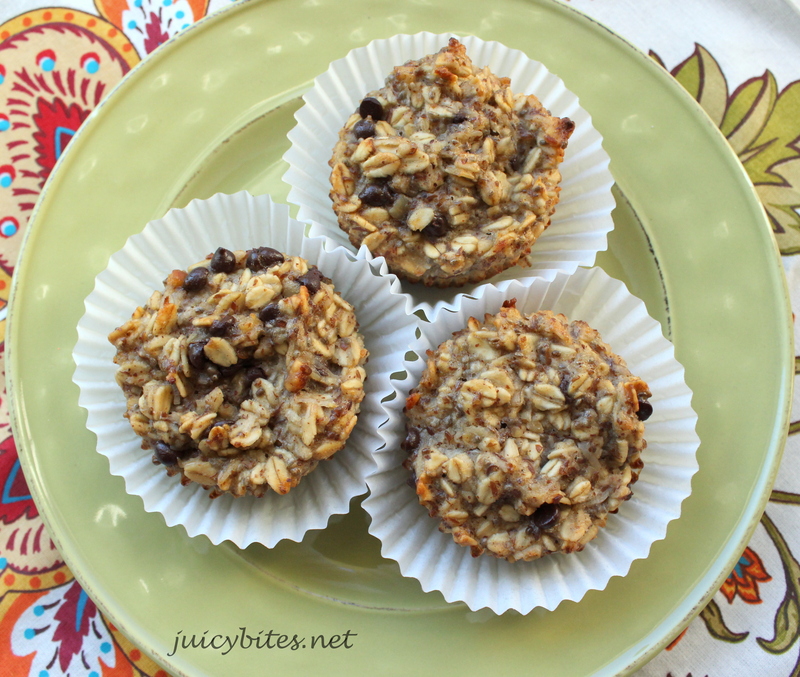 My version has lots of organic, gluten free oats, flax meal, chia seeds, and crunchy almonds. I added greek yogurt, bananas, and eggs too keep it all together. They are the perfect package of whole grains, heart healthy omegas, and protein. These can be whipped up quickly (I use my blender!) and they are my go to breakfast all week. My 10 year old loves them in the morning with a smoothie. I use these gluten free chocolate chips from Enjoy Life. They don’t have any unnecessary ingredients and they are a good quality chocolate. You can adjust this recipe to suit your taste/diet restrictions. Use 1 cup of almond or coconut milk instead of the greek yogurt if you want them to be dairy free. Also, leave out the nuts if there is an allergy. I love having the nuts for crunch and for some extra protein. Now don’t get these confused with a yummy, cake-like muffin, because that they are not. There is no flour to speak of, so they are a little on the dense side. There is also no added sugar besides the coconut and chocolate chips, so they are not overly sweet. They get most of their flavor and sweetness from ripe bananas. You can definitely add a little agave, honey, or sweetener of your choice if you want these to taste a little sweeter. I think the chocolate chips and sweetened coconut give them what they need. My 7 year old (Mr. Picky) said he doesn’t care for them and that if I would make them without the oatmeal he would like them better. Well…sorry Mr. Picky, can’t please everyone. I will be trying some different versions of these soon and I will post if they turn out as good as these. I think they would be great with shredded apple and raisins or with pumpkin. These last about 5 days in my fridge in a zip-lock bag. They also freeze well for longer storage. I throw them in the toaster oven for about 5 minutes to get them warmed up a bit before eating. Combine the bananas (cut them in half), yogurt, almond milk, vanilla, and eggs in a blender and blend until thoroughly mixed and creamy (about 30 seconds on high in my Vitamix). In a large mixing bowl, combine the oats, flax meal, chia seeds, chopped nuts, coconut, salt, and baking powder and mix well. Add the wet ingredients from the blender and stir to combine. Add the mini chocolate chips and mix well. 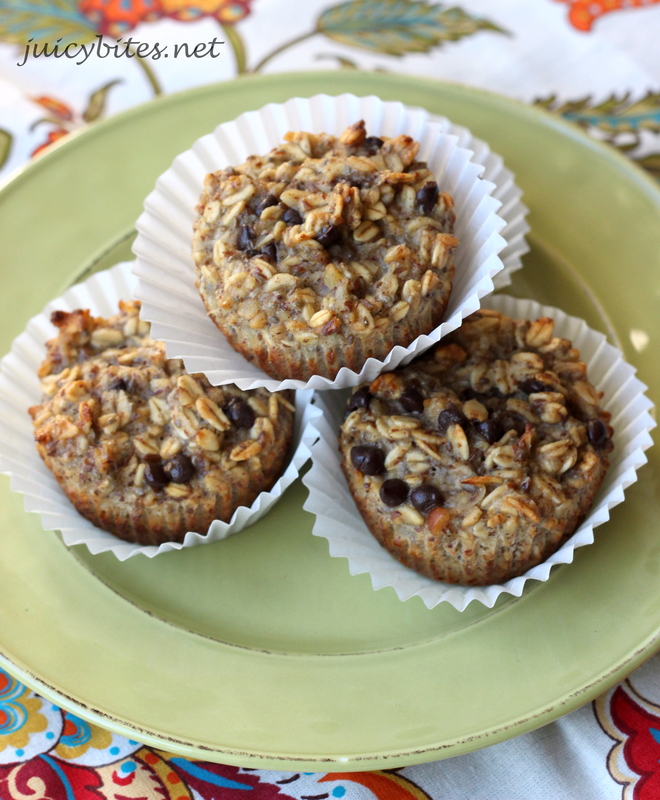 Spoon the oatmeal mixture into muffin tins lined with muffin cups (fill them just below the top of the muffin cup). Bake for 25 to 30 minutes, or until tops are starting to brown a little and they are cooked all the way through. Maybe little Logan would like them! They are in the oven now!!! Can’t wait to eat them!! I knew you were coming back!! I was being very patient!!!! Yeah!!!! Oh and I didn’t have any chocolate chips so I put dried cranberries in there.